After installing a constant lighting circut in an Overland or Sunset steam engine either the bulb or one of the components will burn out. Also these units all have PFM sound, the headlamp will vary intensity with the chuff. Am I doing something wrong on the install or can it be the PFM sound? Hi, I see you haven't gotten alot of ideas so far. What are you using for a headlight? Bulb? What voltage? LED? Is this a commercial board you are using? I have no experience with PFM sound. Is there a way to turn off or disconnect the sound to see if you still get the pulsing ? Perhaps if you specified specifically what constant lighting circuit and bulb you're using, that would help. This was installed in a O Scale USRA Mikado, it was a comercial board with an LED headlight. The Headlight was very bright, it pulsed with every chuff and made it about 50 feet when the headlight popped and smoked. A friend wrote down what he had used for years i tried that it still pulsed and after a couple hours that bulb 1.5v had exspired as well. The manufacturer of the first board said that should not have happened and offered to make it good. Didn't want to try another. Said it may be the sound system. Voltage readings show it was operating as should. There isn't anyone that i know of reparing/servicing PFM Sound Systems. I'm presuming this is a 2-rail application, right? 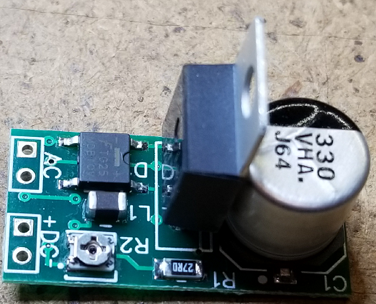 Driving an LED from from a varied AC or DC source is actually pretty easy, and there's no reason you should blow them up! Here's the circuit that is used in my passenger car lighting module, it's a constant current design that will take AC or DC and power one or many LED's, depending on how bright you want them. For a single LED, you could make an even simpler circuit to power it. FWIW, I can't imagine how the sound system had anything to do with the headlight failure, that sounds like a real stretch! What is PFM sound, not familiar with that package? Id still opt for trying the board without the sound system. PFM sound is pretty old technology isn't it? I take it the 22 ohm inductor is for TVS? As to the capacitor, which I assume is in place as a filter, any rule of hand for capacity, I have seen everything from 100uF to 1000uf used for filtering the outpu of a rectifier and never any explination. Typically I just use what's on hand more often than not 100uF followed by a ceramic at 1uf believing that the combination cuts both the high and the low. So, am I smoking crack? Actually, it's a 22uh choke for DCS compatibility. If you'll never run MTH DCS, it's not necessary. The size of the filter capacitor is directly related to the current you'll draw and/or the amount of hold-up time you want for power interruptions. In the case of my lighting circuit, the capacitor is sized to kill flicker from anything for significant track power interrupts as the circuit maxes out at around 45ma. The circuit above is a constant current design that allows smooth adjustment of the LED intensity from around 5ma total current to 45ma total current. This was specifically targeted to lighting passenger cars for command operation with constant track voltage.